Thanks to one of my clients for forwarding this email to my attention. I had not heard of this before now, so I did some research. From what I have read in a variety of online forums, this software is a complete travesty. It functions poorly, doesn’t address the needs of most users, and is subject to frequent crashes and computer freezes despite the (supposedly) frequent updates from AOL. 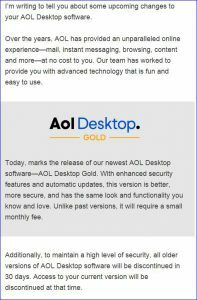 I’m not certain what they were thinking – other than asking hundreds of thousands of older adults for $4.99 a month to be able to send and receive emails – but for those of you who have not paid anything for AOL for years, this is a pretty drastic change. AOL is saying that because they will now offer two-step verification, your AOL account will be more secure. They will be encrypting the emails that are saved on your hard drive so that no one will be able to read them, thus providing you with more protection. And, because you are a paying customer, you’ll have access to their tech support (definitely not US-based). I am going to recommend that you DO NOT install this software unless you want the headache(s) of dealing with it. If there ever was a time to break free of the AOL desktop software, it is now. It should not be too difficult, but I’m going to cover the available options – and there are only three. First, you can opt to sign up to receive the new AOL Desktop Gold software. You must have an existing AOL account and (at some point) you’ll have to provide your credit card for the monthly $4.99 charge. The first 30 days are free. Now I called AOL customer support, and after waiting about 20 minutes for a representative, I asked about that little asterisked statement at the bottom of the email. The one that reads, “To avoid being charged the recurring subscription fee, simply cancel before the free-trial period ends.” This means exactly what it says. You can decide you don’t want to pay for this new software before you get charged. And when you tell AOL that, the software will stop working. Seriously. You won’t be able to access your emails – or your contacts. And you won’t be able to go back to the old desktop software version because the new one has scrambled the crap out of your emails. This is a one-way ticket. I warn you not to do it. If you run into a problem after you install this, I won’t be able to help you – you’ll have to call AOL tech support for help. Second, you can keep your old software and use AOL in a browser. You will have 30 days from when you receive this email notification until your desktop software will no longer work in terms of sending or receiving email. So you can decide to bite the bullet and use a web browser to work with your new emails, as millions of people do. This isn’t a particularly awful transition, because things are pretty much where you expect them. And it is still AOL and all of your stuff is there for you. Your existing desktop software will continue to let you access all of your email that was “Saved to my PC.” You will be able to use any browser (Internet Explorer, Firefox, Chrome, or Safari) to access your mail directly at http://mail.aol.com, where all of our “Saved to AOL” mail exists, as well as your contacts. All of your downloaded email attachments can be accessed through the Download Manager in your old version of the AOL Desktop software, or through Windows Explorer in the folder where the files were originally saved. Third, you can give up using AOL and use another email service. And this means changing your email address, which I know is a horrifying thought. The two free services that I suggest looking at are Outlook.com and Gmail.com. Changing your email address means that you would have to contact everyone you know to say, “Hey here’s my new email address.” You’ll also have to update any website where you sign in, and update any email subscriptions, and your phone and tablet. It is a huge effort, but I wanted to cover all the options. Irrespective of which one you chose, you can save your existing AOL contacts and import them. Outlook, provided by Microsoft, is a free service that uses the same enterprise infrastructure that Microsoft uses for Fortune 100 companies. Only because you are not a company, you will receive AOL-like ads in your email. You can reduce some of them by using the privacy features in the profile settings. The web interface is clean and pretty straight-forward. Gmail is offered by Google. It is free; it can be accessed on any web browser anywhere as well as on mobile devices. Similar to AOL, it is not ad-free. 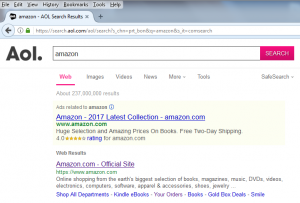 The company will display targeted ads; only not based on your activities in Gmail, but instead on things like your Google searches, the YouTube videos you watch, the apps you use, and the websites you visit. You can opt out of those targeted ads — but not Google’s data collecting — by turning off “ad personalization” in your personal Google settings. There you have it, three not so great possibilities, but that’s the way of the email world in 2017. AOL is rolling out this change in waves, so it may be some time before you receive the notice. I just wanted you to be aware of what’s going on, and to prepare for it. Any questions, let me know in the comments. The Washington Post reports “Massive cyberattack hits Europe with widespread ransom demands.” Updates from The New York Times indicate that this new attack has even spread to businesses in the United States. Barely six weeks have elapsed since May’s WannaCry ransomware attack, which crippled more than 300,000 computers around the world. It is clear cyber-criminals are increasing their efforts to obtain cash. What we are witnessing now is merely a prelude to even more, possibly terrifying, attacks. As you know, ransomware is malicious software that takes over the files on your computer by encrypting them and then posting a message telling you that if you want your files back, you’ll have to pay money (ransom) to the cyber-criminals who performed the deed. The major form of currency for payment is Bitcoin, a block-chain mechanism for payment that provides complete invisibility for the cyber-criminal. It is both currency and a monetary system. Back in January 2017, one bitcoin averaged round $900. Throughout May, when the last ransomware attack took place, prices doubled to roughly $1,800. In mid-June, for reasons that are still unknown, the price skyrocketed to $3,000. And, as of this writing (June 27, 2017), the price is down to $2,374. What accounts for the price changes? Bitcoin is considered a commodity, and the fact that there are a fixed number of coins available, causes speculators to “bid” and “ask” on the amounts just like stocks. As for the causes for the recent spate of attacks? A group called the “Shadow Brokers” exposed hundreds of NSA hacking tools earlier this year. Software, with names like “Double Pulsar” and “Eternal Blue,” ended up in the public domain. Once out in the open it became quite clear to cyber-criminals that anyone who could download that code, build out a distribution method, and set up a bitcoin account would be in business rather quickly. What the perpetuators of WannaCry found out — all too quickly — was that they needed a better back-end support system of “help desk” operators to explain to people how to obtain bitcoins and how to provide payment. In the end, one researcher found a controlling website name, purchased it, and effectively turned off the ability of the malware to “phone home.” As a result, files were not encrypted and the bit-coins did not reach the cyber-crooks. The lack of adequate planning “cost” them hundreds of thousands of dollars. The majority of computers that were affected in May were running Windows XP, an older operating system that Microsoft stopped supporting in 2014. Yet there were also thousands of Windows 7 computers that didn’t have the April 2017 Microsoft monthly update installed. There’s the 1999 film quote: “The first rule of Fight Club is: You do not talk about Fight Club.” Well, the first rule of running Windows is: You really have to install your Microsoft updates. 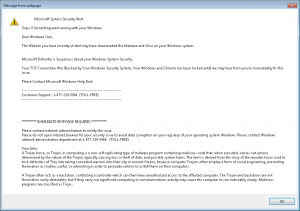 So why, if businesses know these horrifying threats exist, don’t they update their computers? I don’t have an answer for that, because not patching computers doesn’t make any business sense. You can say you don’t have the time or the manpower, but those are not valid excuses. Because the reality is this: if you want to continue to use your computers while these scourges exist, you should invest in an automated means of patching them! You should be verifying your backups and check that they have all of your data. If one of your computers gets hit, you must have the ability to restore those encrypted files. If you don’t take backups now, then add that to your list of things to do. Finally, you need to upgrade your security tools. If you only use an anti-virus product that scans for known virus signatures, you are not adequately protected from these zero-day threats. You must have a modern, enterprise-grade, Internet Security product along with malware protection. What is a small business or individual supposed to do if they get hit with ransomware? For one thing, they should contact the FBI and the local authorities. In 2000, the FBI established the Internet Crime Complaint Center (IC3) at htttp://www.ic3.gov where you can fill out an online form to file your complaint. 2,673 complaints identified as ransomware with losses of over $2.4 million. 10,850 tech support fraud complaints with losses in excess of $7.8 million. Wait; what’s that? 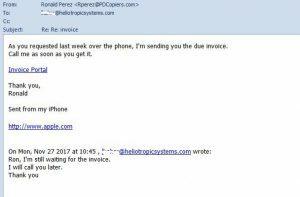 Last year, the FBI received four times as many reports of fake “tech support” complaints as they did for ransomware. And those cases cost small businesses and home users three times as much money! This leads me to conclude that more people fall for the phony phone calls from “Microsoft” saying there are problems with their computers — but are willing to report and admit it — than they are about reporting being a victim of ransomware. Undoubtedly this is because the files that were encrypted were client-related and could cause substantial problems for their business and have ramifications in terms of bad press, privacy breach notifications, and possible law suits. Every hardware component and computer that relies on software must be patched automatically, your Internet Security software must be enterprise-strength, and back-ups taken and inspected regularly. The threats already exist out there, and they are not going to go away any time soon.